Now we live week to week, so knowing how to watch Game of Thrones season 8 episode 2 is vital. Having got off to a measured but excitement-building start with episode 1, we are now back to ticking off the weekdays until every Sunday comes around to get our Game of Thrones streaming hit. There are already some serious questions that need answering, characters that need to be made aware of things and battles to be prepared for. In addition to how to watch Game of Thrones season 8 episode 2, you need to know WHEN to watch it. To be safe, and to get the important stuff in early, here's your reminder to be primed and ready for later today as it airs in the US at 9pm on HBO and will again be simulcasted in the UK at 2am on Monday morning on Sky Atlantic and via NOW TV. For those of you who prefer a more civilised time, it'll be on in the UK again at 9pm on Monday night. If you need to re-watch episode again in preparation before episode 2, then remember you can still watch episode 1 now easily with a subscription to HBO Now and NOW TV. 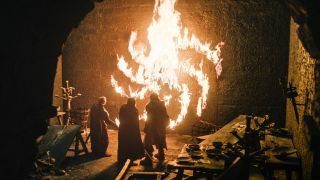 But, moving forward, we have rounded up the best ways for you to stream Game of Thrones season 8 episode 2 this Sunday (and after). There's plenty of options available to you, wherever you are in the world, and its not necessary to have an expensive, pre-existing subscription with a particular provider like one used to. From starting a new HBO subscription, an excellently convenient NOW TV stick or one their temporary Entertainment passes. Another method that may not be on your current radar is that of VPNs. These will allow you to watch Game of Thrones season 8 episode 2 from wherever you are in the world. If you've gone on holiday or are away for business, these handy systems will allow you to access streaming services no matter your location. We've got a handful of favourite VPNs and the following are our top recommendations. ExpressVPN is our favourite VPN for accessing TV and film, and it's the often ranked number one in the world generally. This is because its speedy, reliable and secure and compatible with loads of devices. They have a current offer of an extra 3 months for free at the moment, too. IPVanish supports an enormous number of devices so is great for watching on the go, while its security aspect will keep you safe. NordVPN is an affordable option and also includes SmartPlay tech. Putting it bluntly: it's an HBO show. And so the best way to stream it in the US is straight from the dragon's mouth, by getting an HBO NOW subscription. They offer several different packages, each offering a free trials at the beginning. Prices for the pleasure start at $14.99 a month and increase depending on which package you choose - naturally. Game of Thrones Season 8, episode 1 is now available on HBO to watch now, post its original launch, and you can do this with every episode in the future, being able to re-watch it on catch up again or easily watch it at your convenience if you can't get it 'live'. If you're out of the country, don't forget your VPN options above to help access your HBO NOW account on the go. UK viewers will generally have two options available: go straight to the source and subscribe to Sky TV to get the Sky Atlantic channel that's necessary, or access it via a NOWTV Entertainment Pass. You can use these methods to get previous episodes on catch up too. NOWTV provides the best short-term option for Throners as you can get a 3-month Entertainment Pass, that includes a 7-day free trial, for just £17.99 which will neatly cover you for the whole of Game of Thrones season 8. However, you too can still peruse the VPN options available to you, particularly if you are abroad or away from your regular services for some reason. For our Canadian pals, the best streaming option is found at Crave. As with other streaming services above, you can pay monthly for Crave but you can also go for an annual subscription. You won't get free trials, but if you plump for a subscription, they will throw in one month for free. Prices vary but the packages you'll be looking - ones including HBO - are around $20 per month. Of course, you might want to try the above VPN options if you're on the move or unable to access due to pesky geography. Fans in India probably have the best option available to them for streaming Game of Thrones. Scooting over to Hotstar, you guys can sign up to a premium account for only ₹299 ($3) for a month or ₹999 ($14) for an entire year. The first episode has already aired and is now available on Hotstar to catch up on. Don't forget your VPNs too, if need be. If you need a big catch up on the series as a whole, we have a recap video that gets you all caught up in 16 minutes, which is quite an achievement. And don't forget, if you're not in your native country, you can always hook up to your HBO account or your Now TV subscription via a VPN, which we've listed above. And if you live in India - lucky you! Hotstar is showing Game of Thrones for only a handful of dollars per month, way less than anywhere else in the world. Make sure you get your preparations done early so there's no panic, and in the meantime here are some more features to get you fully immersed in Thrones.